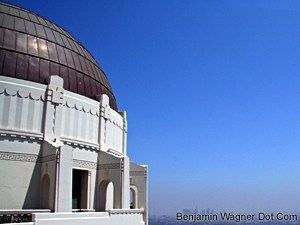 The first time I visited Los Angeles, my friend Matt Kinney drove me up high above the Hollywood to Griffith Observatory. There, I sat in on a bench eating an In-N-Out burger as Matt gave me the lay of the land. I remember feeling awed and excited, look I was looking out at my future. Here was everything that was possible: a city, a sea, a back lot, rock club, and home in the hills. Years later, in the JFK-LAX (aka “Almost Home”) Era, I often woke before my then-girlfriend, Stephanie, drove west on Sunset, and jogged up those great, dusty trails. It was just a matter of time, I was sure, until I made L.A. my home. This afternoon, en route from Universal City to Beverly Hills, I detoured there once again. The Observatory, fresh from a recent renovations, glowed white against the blue sky. I was struck by the bold, clean detail of its Art Deco facade. With its larger central dome and twin, adjacent smaller ones, it is a study in symmetry. Approaching from the north, it looks like a sleeping giant’s head and shoulders. I walked slowly around the east side, noting the sound of each footfall. A young couple clung to the wall, looking out over Los Angeles, and falling silent as I passed. An Indian family posed before the great, smoggy vista. And out back, two twentysomething men sat on a bench. I’m not sure the neighborhoods mean much here, though. It all blends together in a great grid of low, flat, great unwashed blocks. Above it, though, tucked into the canyons, the glitterati rest in their Spanish tile and white adobe while the city below bustles and stalls, bustles and stalls. Standing there, looking out over it all, it took me a minute to realize how quiet it was. Where just 24 hours earlier I was stepping over cable runs, dodging jib cams, and braving general red carpet chaos, here, now, I was nearly alone. I heard the low whirl of traffic below, and birds overhead. And I felt the breeze shift and change. From the ocean, it blew cool and fresh. From the mountains, arid and piny. Los Angeles is like that. It is is all things to all people. It’s the world’s projection booth. They come here to be something, to make something, to invent something else. Today, though, I felt still above it all. My vista wasn’t what might have been, or might be, but what is. And I stared off into the haze until I couldn’t see anything at all.